Taman Mini Indonesia Indah has many beautiful landscaped of gardens and parks. Each with its own theme. They are not only for sightseeing and relaxing, but we also can increase our knowledge on flora and fauna. For example, we can learn botany in the Herbs Garden, or know more about birds in the Bird Park and Bekisar Park. 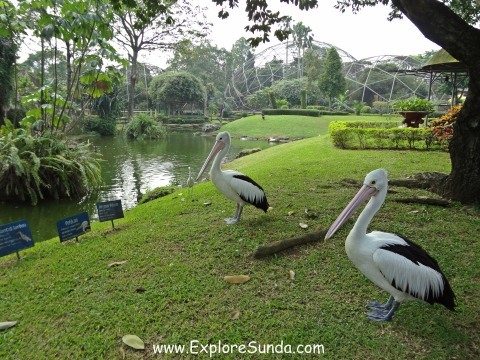 Let's start our exploration with our family's favorite park: The Bird Park. 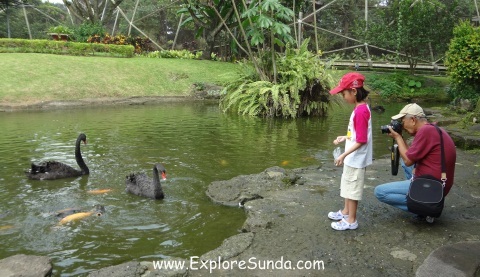 There are two bird parks in Taman Mini Indonesia Indah, but our favorite is the second one. 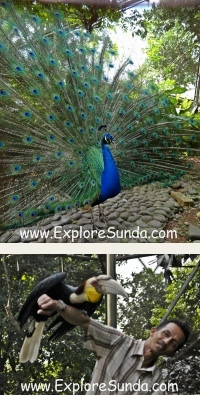 The second bird park is divided into two zones: the west dome for birds from the western part of Indonesia and the east dome for birds from eastern part of Indonesia. We walk through a man made tunnel to cross from the west to the east dome. Back to the dome, many birds fly freely here, but the predators such as albatross, Javan Hawk, and eagles are in the cages that are arranged circling every side of the domes. There are many beautiful peacocks, both blue peacock (Pavo cristatus) and green peacocks walk freely in the park. Often they show off their beautiful tails. We even can take pictures with some birds, like toucan, black cockatoo, white cockatoo, and eagle! We only need to pay Rp. 5,000 for one bird, but we must use our own camera. In addition to birds in the domes, the birds are also put in big cages on the way out of the Bird Park. A couple of storks and pelicans walk freely in the park. We also will find cassowary near the exit gate. As its name implies, the collections of this garden are cactus and succulent from around the world: Belgium, Japan, Mexico as well as Indonesia. 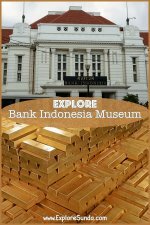 Indonesia is rich with herbs, some are already well known and used in the modern pharmacy industry, but many more still need to be researched. Thus, in this Herb Garden we are introduced to many herbs from Indonesia. This garden is supported with a library and a laboratory. The mission of this garden is to cultivate seedlings of flowers. Since it has a beautiful landscape, we also can rent it for garden parties and meetings. This is the latest park development in Taman Mini Indonesia Indah. 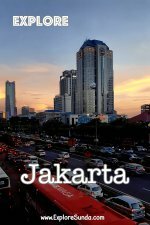 Its development reaffirms the Indonesian Chinese existence in Indonesia. The concept of Yin and Yang dominates this garden. It is also decorated with several statues depicting Chinese legends. 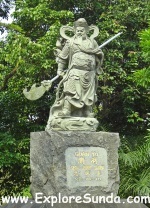 For example, the statue of General Guan Yu representing loyalty and bravery, the legend of Sun Go Kong went to the west to find the book of Buddha and the statue of Sam Pek Eng Thay. There are two pavilions at the lake sides, where we can take a rest while enjoying the scenery. Last time we visit the Tionghoa Indonesia Cultural Park in August 2013, it is not finished yet. 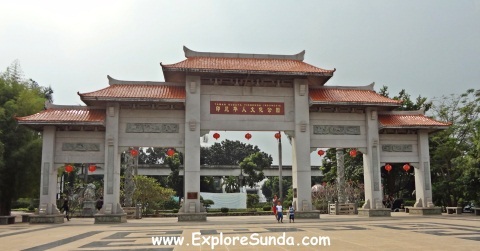 They are still building two museums: the Haka Indonesia Museum and General Ceng Ho Museum at the back of this park. This garden is located behind the Keong Emas IMAX Theatre. The theme of this garden is based on the legend of true love between “Raden Panji Asmara Bangun” and “Dewi Sekartaji”. According to the legend, the princess was bewitched into a golden snail, which would be broken when she found her true love. Bekisar is a type of rooster, a crossbreed between a green jungle fowl rooster (Gallus varius) and a domestic chicken (Gallus domestica). It has a beautiful voice. Thus, many people bring their bekisar for competitions. You can come to this garden to watch the competition, learn how to raise bekisar, even you can bring your bekisar to compete. 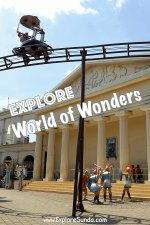 If you are interested in visiting any of these gardens and parks in Taman Mini Indonesia Indah, they open from 9am to 5pm, but they will be closed sooner during the month of Ramadhan, and we have to pay separate entrance tickets for every garden and park we visit.